You’d have to have been living under a rock to not have heard of S.T.E.M (Science, Technology, Engineering, Math) or S.T.E.A.M. (A = Art) over the past decade or so. It has become an important part of education policy and curriculum choices in our schools to improve competitiveness in science and technology development. And while we’re seeing a push to better our kids’ access to S.T.E.A.M. resources in the classroom, there really hasn’t been a wide range of educational toys available specifically targeted to this area of the market. 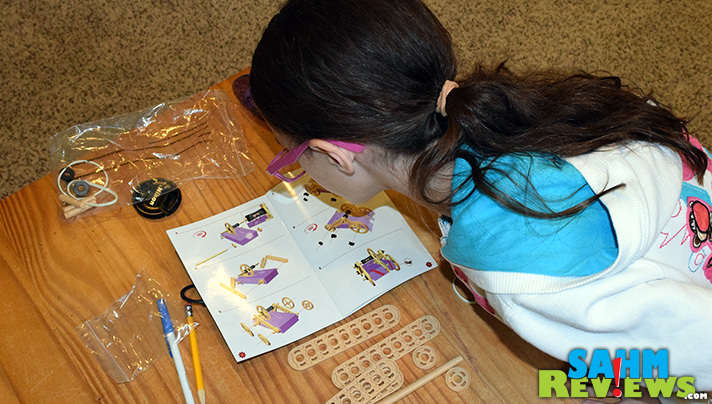 We regularly encourage our girls to watch S.T.E.A.M.-related shows on Netflix and that’s why we were excited to learn of ThinkFun’s latest line, Maker Studio. In what I can best describe as a modern-day Erector set, the series was created by two dads who also happened to be engineers. But what makes the Maker Studio line so different is that you are able to transform everyday objects into working, moving ‘things’. 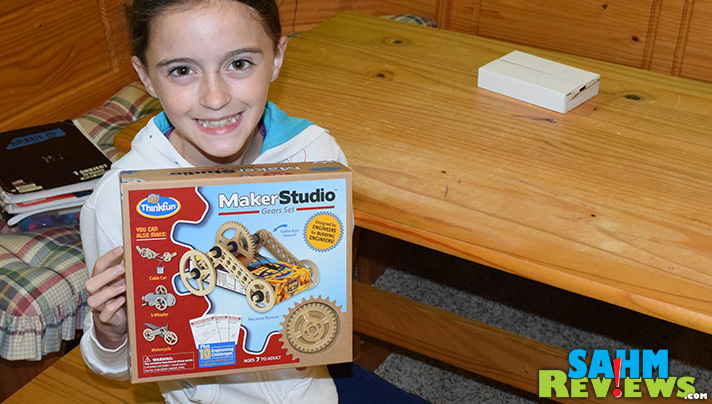 Each box contains everything you’ll need to make a number of exciting creations. 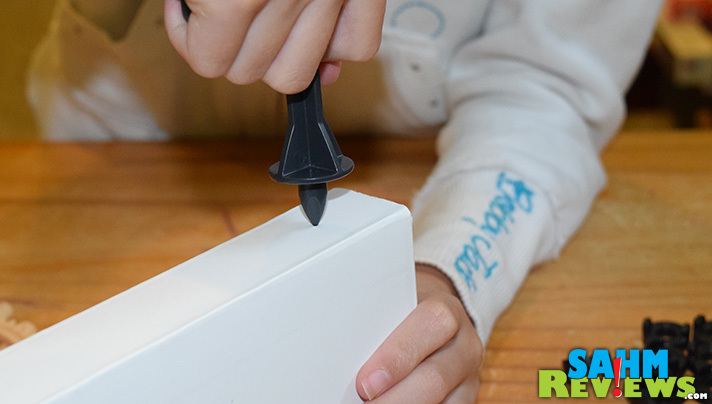 Grab a box or carton from your recycling bin and you can turn it into a fun toy, thus getting another use out of it before the weekly garbage pickup! Every year we purchase rolls of coins from the US Mint to complete our daughters’ (and friends’ and family’s) Presidential Dollar coin books. The Mint, not being the most environmentally correct organization out there, ships each roll in its own labeled box. Four presidents per year times two mint marks each makes eight sturdy boxes that get used one time. Until now. The included instructions are very easy to understand and well-illustrated. 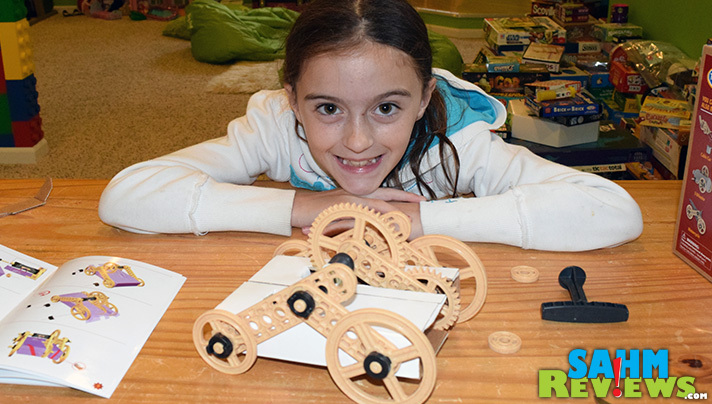 In our “Gears Set”, we had the option of making a race car, a cable car, a 3-wheeler or even a motorcycle! Of course like any good building set, your final creation is only limited by your imagination. 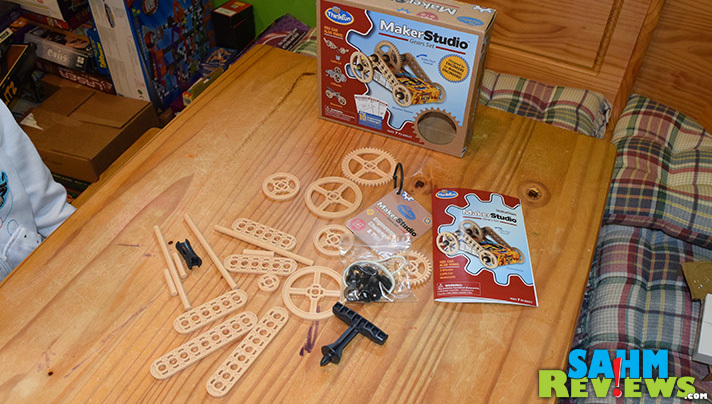 And unlike other building-block sets your kids love, Maker Studio Gears Set requires critical-thinking skills to solve mechanical problems that might arise. In our case we needed to experiment with a couple different configurations to accommodate our box size. 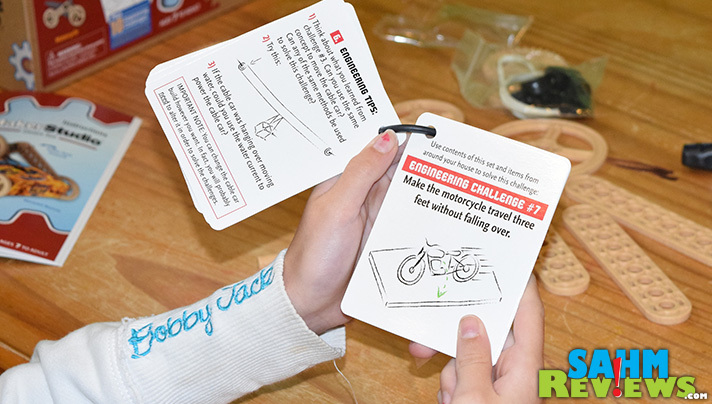 If you’re familiar with some of our other ThinkFun rundowns, then you know they usually provide cards with their puzzles and games that offer challenges of increasing difficulty as you complete them. 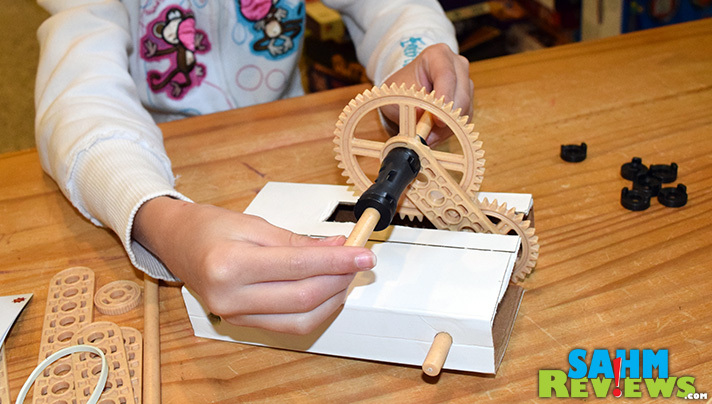 Maker Studio borrows from that idea and challenges you to use your creations to perform tasks. Shown above, try to make the motorcycle travel three feet without falling over. Of course, this might require some design changes to successfully complete it – and that’s all up to you! In another example you use your car to push an apple across the table. We had a bit of a torque issue with our model, meaning a lot of spinning wheels. But as I always say, too much power isn’t a bad thing! Our youngest had no trouble at all completing her model on her own. Well, due to her small stature, dad did have to help a little with pressing the pieces together – but figuring out the design was all her! I loved watching her make a small error and then pour over the instructions to determine what went wrong – and then correct it! As I mentioned before, we’re strong proponents of the S.T.E.A.M. initiative and are happy to have found a learning tool that is well-made and provides both entertainment and a learning opportunity. Keep an eye out for Maker Studio at your local retailers. You’ll also find the entire line on Amazon for under $20 each. A perfect price point for your next birthday party invitation! 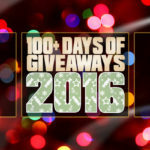 Be sure to watch ThinkFun’s Facebook and Twitter timelines for exciting announcements and maybe even a giveaway or two! 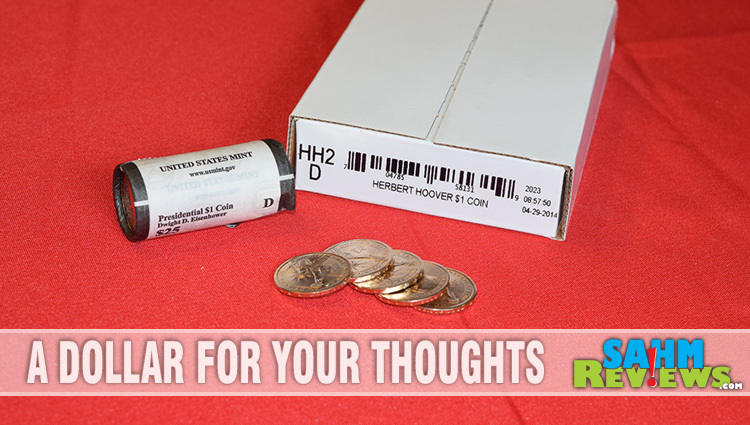 Here’s one that we’re offering especially for SahmReviews.com readers! I have not heard of this brand before!! I love that this gets their creative minds going to build up the toy! Looks like it would be fun! I think my son would have such a blast building something like this. Very cool! My older son is really into figuring out how things work and I think he would really love this! I’m going to add it to my list of things for him for this summer! This is such a cute way to recycle boxes! This looks like a great summer time project to keep their minds challenged over the summer. I’ve seen lots of more products like this, especially for engineering. I think it’s great to have these kinds of products to help kids experiment and see what they enjoy. Many times people say if you have trouble figuring out what to do with your life, think about what you loved and enjoyed as a kid and that’s a good indicator of where to start. I bet my kids would love this. My youngest son loves to build things. Interesting. You always feature the coolest toys and games. Thank you for sharing them with us! These Marker Studio sets sound so amazing indeed and can be very beneficial to all kids using them. I will have to share this with my sisters and my niece who all have children. My boys are man now or close to it anyway. These would make great gifts for the kids too. Thanks for sharing. I love that it integrates recycled items! That looks like fun. I admit that math and science were not my favorite subjects when I was younger. I think if I had things like this to do I might have liked it more. This looks so cool! My niece and nephews would love to this. We love to focus a lot on toys and activities that fit in with STEAM. SO this is awesome. I haven’t seen it before, but my boys would absolutely love it! One of my grandkids-probably Christopher would really enjoy this. I think my daughter would really enjoy trying this! My 2nd graders would love this. My daughter really loves making things like this so she would get the most use out of it! This would be perfect for my grandson,he loves stuff like this.thanks so much for sharing. I think that my nephews would love it! Always looking for gifts for the kids. My daughter LOVES putting stuff together, this looks great! Thanks for sharing.